This is one truly off-the-wall release. Sebkha Chott is a collection of eight French musicians with strange pseudonyms. The digipack and liner notes are extremely difficult to decipher because of tiny print and the artwork. Nagah Mahdi is a 68 minute CD containing a total of 48 tracks — do the math and you will rapidly see that most of these songs are two minutes or less in duration. The interesting approach here is that all songs flow seamlessly from one to another. The clue to the track changes is the rapid shifting of musical styles. You feel that Sebkha Chott recorded every single style of music they know on this disc: harsh electronics, punk, salsa, reggae, cabaret, acoustic gypsy, industrial, klesmer, etc. The promo material mentions Frank Zappa as an influence, but I think that only applies as an approach to composition. 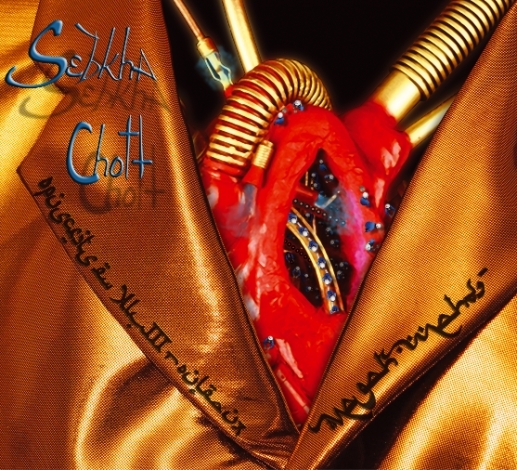 Sebkha Chott definitely does not sound like Zappa. But there is that sense of insanity in their music and the numerous sexual references. The zaniness of the band is also evident in the video clips on their web site. This is a difficult release to categorize, let alone listen to in one sitting. The harshness of many of the tracks may only appeal to young male adults. However, there are some very pleasant interludes sprinkled throughout, but on the whole, this is not a CD you want to play for background music.